Every employee who has his/her Labour Contract through Ministry of Labour (MOL) will need to sign his/her Labour Contract before the residence visa can be stamped. All the MOL labour contracts are available online that can be checked at anytime by employees if they so wish. If you are working in UAE, I would strongly advise you to read and understand your employment contract terms and conditions, so that you may not fall into trouble in the future. Many people take the contract for granted and sign it blindly to realise later the kind of trouble they have got into. Ministry of Labour has taken down the link to check Labour Card / Labour Contract information from their site. This I believe is done to integrate Emirates ID and Labour Card. I will soon update this page as and when new information is available. Below is how you can check your official Labour Contract/Labour Card information online through MOL website. Head over to MOL Website: www.mol.gov.ae. The default language is Arabic. Choose English if you wish on top right. Select eServices on top menu and again Eservices in the secondary menu as shown in the picture below. Once you click you will be provided with various options. Out of these Select eNetwasal Services. You will now be redirected to a new page which has various options like: Labour Card Information, Contract Information and other options. Now you select whatever information you would like to retrieve. Once you click on the relevant link, you will be asked ‘whether you have a Labour Card?’ Select Yes and click Next. At this point you will be presented with a screen where you are required to enter Labour Card No(This is the 8 digit Work Permit No mentioned in the Labour Card), Person Code(This is the 14 digit Personal No mentioned in the Labour Card), Year of Birth and Nationality. In the next screen, depending on your previous selection, you will find all the details with regard to your Contract Copy, Company Name, Company Code, Your Name, Designation, Nationality, Passport number, Passport expiry date, Labour Card number, Type of card, Issue and expiry date of your contract and transaction number. Your salary will need to match as in this page as salaries are routed through WPS (Wages Protection System). This is how you check your Labour card information, your official labour contract copy online on www.mohre.ov.ae. These days, MOL does not issue labour card as it is integrated with Emirates ID. In such cases, if you wanted to check your labour card/contract details, you could check it with following details: Passport Number, Date of Birth, Nationality and mobile number. One different thing here is that, you will have to go to a Tasheel Centre to get print of your labour contract/labour card. 6. The following screen will prompt you to print a document with your details which you will need to take to Tasheel Centre to get the print of your labour contract. hello. I checked my application status a week ago and it was in “approved” status. and as per my company hr, my visa is still on process. just now, i checked it again and status is “USED”. can you please explain the meaning of this status? thank you. Hi.. My employment contract is expiring in Nov 2017 but my visa valid till Feb 2017, Should I insist my employer to renew my contract, he has asked me to wait till Jan 2018 for renewal as he wants to renew my visa and contract together at once. Pls advise. I checked my application status and it mentioned ‘Used’. What does that indicate? and roughly how long does it take to get the approval? Sorry, I do not understand your query. Yes, you should request your company to cancel your application. Not sure about this as house maids do not come under UAE labour law. Kindly note that I have been newly employed by an employer in Abu Dhabi on an unlimited contract since February 2017. Due to personal reasons, I would like to resign and join my family in Dubai. My husband plans to take a dependent visa for me under his sponsorship once my new employer cancels my visa in the passport. My profession is mentioned as Auditor in the unlimited contract and I hold a Chemical Engineering University Degree attested by Ministry of Foreign Affairs in UAE. I would like to know if there would be any ban imposed on me if I resign from my company within probation period or will I have any issues when my next employer will apply labor contract or employment visa for me as I plan to work with a Dubai company in future. I applied for job in abudhabi through contract company.They already submit my documents in ministry of labour. After some days i asked them about my mission visa. They are told me your visa is rejected by ministry of labour. Sir i am very confuse becouse it is first time happen with me. I dont known why they are rejected my visa I want to know the reson about my mission visa. Can i apply again for job in abu dhabi or not. Please give me your suggestion. Thank you. Have a good day. Can u tell me how can I get my visa number from labour contract ? 1. When I joined the company gave me offer letter for 12k +2k for HRA & CAR,Salik, Fuel and Other allowances. As iam n sales they have asked for 200k gross profit Target to achieve for that 5% incentive will be paid. 2. For processing visa they send me soft copy of last page of Govt Document. 3. I signed and send it, got visa and air ticket and joined last month. Now after I took my medical and Emirates ID, they showed the original contract which shows. 1. Only 12k salary all inclusive. 3. After achieving the GP only they are telling Salary will be paid. 4. Salary for the present employees is not been paid properly also. They forced me to sign the contract as they hold my passport, as I had emergency to go to India for 1week. They made me to sign the contract. Mr. Deepak, let me know if I will get as per offer letter or not? If I resign Will I get Ban,? Will I get job again here in Dubai? Please iam confused, looking for your reply and support. Hello Mr. Deepak I’d be very grateful to you if you help me in giving some information regarding e-work permit. I’ve checked my contract on MOL website and it is showing card no. issued on 14/12/2016 and expire on 14/02/2017. Kindly let me know how much time now would it take to issue the visa on my name…. My work permit is under processing and I was just browsing the MOL website to see if my contract is available to view. I followed the above steps and it also gave me the labor card information request receipt. However this receipt is valid for only 5 days from date of request. Can this receipt be reprinted at a later date? Im working as receptionist in a massage spa for 8 months and i want to leave for some personal reasons but my employer told me to pay 9000dhs for the visa and if he added also if he will cancell my visa i cannot find job here in uae. Can you help me also to check if i have labour contract because i dont remember that i sign and i just want to know also if ever i quit my job is there a labour ban? go to your nearest tahseel office with passport and visa and id card copy they and i want orignal contract copy so they will charge you 70 to 100 dhm and they will give you. i would like to share a problem with you 4 months before my owner told me that our business had to face lot of losses and i am not able to give to salary further more so you have to move from here and search another job he dos’t cancelled my visa. Today i am unable to found any job here but i want to cancel my visa but my employer did not cooperate with me he says first you clear your balance account then he will cancel my visa but i have no money. when he dismissed from the company he had not give me any compensation like 2 advance salaries and gratuity. so please tell me what should i do? Sir pls I want to check if my visa is already in process but I don’t know how to. Pls help me I really want to know. I have completed almost 18 months in my company and applied for an annual leave. The company approved my leave but is asking me to keep deposit of AED 2200. Can the company do such thing. recently i renewed my contract with my company. previously my contract was unlimited but now its showing limited contract. when i contact typing centre they said its mistake instead of putting unlimited they put limited . Pls,I need more explanation on this words; “REQUEST FOR PRINTING PENDING WITH TASS’HEEL ENABLED TYPING CENTRE” on Labour Card view approved by employee page in Ministry of Labour website? I checked my Approved Labour Card tru http://www.mol.gov.ae but I found out the words quoted above on my Labour Card. I called my company PRO and he said it waits for printing but am not satisfied with his response. Please,kindly shed more light on this for me due to your experience in Dubai Employment visa .Your quick response will be highly appreciated. Dear Sir I Have Applied 4 a Job In A Company, But I Have Not Recieved My Working Permit. What Can I Do? Hello Deepak, Hope you are fine. I am in Pakistan. I wanted to know that i just received an offer letter that is based on Eleventh article. Can you please guide me about this article, what it is meant by or what kinda visa is this. how i can check is there any ban. I am on an unlimited contact as an engineer at Dubai. And, I just entered my probation period that lasts for 6 months. It is my first month here. I got a job back at India. How am I supposed to cancel the contract? My name is Aimie Aseñero Ampalaya, from Philippines with passport number XX3345685, birth date: 20/06/1989. I want to know my ban. I was working in A Real Estate Company in International City, My Pakistani (North Alsama Real Estate) employer sexually harassed me and I reported it to the police on March 2013. After a week when the incident happen, they canceled me and reported absconding. I want to know my status and my ban. Please I need help. Hye sir. Can u tell me how i can check that my visa approval has done from labour office or not? Hello, i am working from more than one year in LLC company ,my contract is limited for 2 yrs and just before a month i came back from vacation and suddenly i know that company is sold to another employer, new employer don’t agree with old salary as per your agreement. he wants to reduce more than 50% else he wants to cancel my visa…from one month i am setting without job.. what should i do for the same? another thing i would like to share that they are not paying my wage as per my contract. my contract is 7800 but i am getting only 5000.
should i go to MOL for salary complain? Hello, i am working from more than one year in LLC company ,my contract is limited for 2 yrs and now company is sold to another employer, new employer don’t agree with old salary as per your agreement. he wants to reduce more than 50% else he wants to cancel my visa… what to do for the same? hello, my husband works here in abu dhabi. he don’t have any copy of his labour contract. i tried checking for his labour card online thru MOL’s website but it says employee information does not exist? what does it mean? he’s been working here for 2yrs already. How could I know if my sister working visa is truly in process.???? I had been selected a Nursery School in Abu Dhabi, I worked with them 22 days since Sep 01, 2015. Then they stopped me due to the labour card reason. How i can check the labour card status? I am in under spouse sponsorship, if i get another firm can i join? You could call MOL: 800MOL and enquire. Hope you’re doing good. I have been working here for the past two years (jan 2016 my visa ends). In this case, I haven’t signed in any agreement. Actually I did not have any awareness about that agreement. But if I check my contract details, my salary is just 1500 basic and 2000 total. But I was said 2500 aed per month. Without my signature, how it could be possible. And please tell me what should I do now? I was paid sometimes 2500 and sometimes 2000. So could you just tell me? Thank you so much depak sir for ur reply. And now im with no confusion rwady to apply and find a gud and reasonable job for me. Im new in dubai and i just joined a company,its just 1 month i started my job.its 2yrs contract and its unlimited.my basic salary in contract is 800aed per month. I just want to know in which conditions i dont get 6months ban if i quite the job and want to join in another company ??? I have unlimited contract with total 18000AED salary per month. I am working through agency in Oil and Gas Company Abu Dhabi since July 2015. Now I got another offer with 20K AED. I want to know ban will apply or not and how can be removed. And what is minimum notice period to leave current job. For salaries above 12K, there may be no labour ban. If you get terminated under Article 120, you may not be eligible for any facilities. I have been doing current job since 14 months. I wouldn’t like to continue current company. I would like to cancel the visa before finish my contract period.If I cancel visa do I get ban for six month? What about the ban sir? Could you possible mention it sir? If you do not complete your contract, you may face labour ban. Can u plz tell me how to check the salary mentioned on my labour contract online.. I don’t have hardcopy of it..
How to check the salary on labour contact mentioned? Sorry, I can not say anything about this process. But Now checking with mol its saying now that emplyee information does not exisits. I am worried for it. Help again . I am not sure why this has happened. WHy don’t you call the MOL? How can I get my person code? I think that is mentioned in labour card if you have one. I came at my cousin tailoring shopal ain. I apply for light vehecile driving licence. I completed only one months in uae al ain. Can I change my sponsorship in any other company before 2 years. Its possible. Whats is the rule in al ain . Please tell me…before I m driving in Qatar 6 yrs. You would have automatic labour ban. when I checked my Application status online with Mol website today it answered like that. Request already pending for printing with the tas’heel enabled typing center. PLz guide me what it means. I think that means the labour approval is done. I am n my home country Pakistan waiting for my employment visa according to employer is underprocess. Yesterday when i check it through Mol website it was showing that Employee Information doesn’t exists. But when today i checked i got that message with a page having my pic with few detail. Request already pending for printing with the Tas’Heel enabled typing center. Thank you for using eNatwasal services, Kindly visit Tas, Heel enabled typing center to print the requested information by providing this receipt. Maximum services charge collected by the typing centre will be 5 dihrams only. Validity of this receipt is 5 days from request date. I think that means your labour approval is done and the company should not apply for entry permit employment visa. I sign to my company two years contract but because thy dont follow wt in the papers says…I wnt to cancelle my job and find another job I’m the school….as cleaner I’m in unlimited contract job…im done my one year here in this job..mif I cncell my job ..do I should pay and I’m in band. ? You could check your labour contract online. It is illegal for employers to keep the employees’ personal documents. Hi…My question is that I have entered in Dubai on 8th of October so I can cancel my Visa after 8th of October to avoid ban or I have to wait until expiry of Residency that is 23rd of November? I think he is talking about Entry Permit which is a Pink colored visa with which you can enter UAE. what mobile number should we use for checking? I would like to inquire regarding my labour contract. I need a copy of it and my colleague advised me to go to any Tas’heel center. When I went there, I was informed that I our PRO didn’t pass our contract because it’s not showing in the system. I have to pay tha 2000AED fines before I can acquire a copy of my labour contract. I would like to ask how come I have my visa stamped by MOL and I don’t have a labour contract. Visa is not handled by MOL. Visa is handled by immigration. I am not sure why there are fines!! Hy sir,my company already applied for my employment visa but when I check out yesterday on molecular it’s showing invalid details, and today it’s showing document does not exist. …that’s meaning that my visa it’s rejected from the labor? your company has not applied for your labour approval. Sorry, i don’t understand your query! Labour department does not issue visas!! What does it mean. Does my visa approved..? MOL does not approve visas. They process labour approval. Visas are issued by DNRD in Dubai. You should check with them. Iam working here in Dubai as a accountant . I have labour contract from my employer . It will be started from my joining date(End of march 2014). At a time , i was visiting visa (3 months), After may , i go Iran (Kish) for exit , After visa issued on july 2014. July will be the actual starting date. Working on visit visa/ tourist visa is illegal and can not be counted in the contract. Gratuity must be paid for all the working time with the same company for more than a year. yes, you may face labour ban. You don’t need to pay anything to employer. I am on my husbands sponsorship and working with a company for five years now.. my first four years were on limited contracts ( 2 limited contracts) . the last limited contract ended on 27 feb 2015. due to some unknown reasons they have not yet renewed my contract however I am still continuously working with them and receiving my salary. I have just been informed that when they renew my contract next month they will not back date my contract start date. I was also told by a friend that when my company goes for renewal the labour department will automatically backdate my contract and intern my company is entitled to pay a fine for the delay. kindly clarify this matter for me as I am intending to work of this company for five continuous 5 years so that I can be entitled for a gratuity. Your initial contract will be applicable if you have continuously worked for the company. sir i m working in trading and start the job in this company before 1 month but i m not statisfy of this job . Would like to ask, because I have been working in my current company now for 7 months and the haven’t given me any copy of my labour contract and as I am searching it online mol.gov.ae it was showing that print tasheel for typing. You should already have a labour approval. please l work with Elite security company but l have never received my employment contract. what they always that l should down load on mol website but l tried and failed, how can you help me? You should ask your company. good day sir. i would like to ask how can i request again sa receipt print copy becasue i lost the copy and when i go back to the website to querry again for the labor card info, it says alredy on tasheel for typing but i dont have the receipt. please advice what to do. Please speak with MOL in this regard. Dear friend I can’t check work contract details above said check with mol.gov.com that only checking labour card but now I am renewal my visa this time they are not giving me labour card they give only Emirates I’d only so please tell how to I check contract I need now because my company increasd my and basic I just know please brother tell me. I recommend that you check it with MOL smartphone app if you have one. Sorry, I can’t speculate on the number of days taken. You must follow up with the PRO. Hi deepak hope you are doing well , i resigned my limited contract during probation period, please tell me how long labor ban imposed on me ,after serving ban period can i join job in uae. Usually under limited contract, ban is imposed for 1 year. After this period you could work in UAE. How r u doing hope well!!! Very good job done have been reading all your comments … very helpful as due to half knowledge of Laws; fake visas are issued & Agents are taking handsome full of money for sending people in UAE & there is no point of contact in UAE to get proper guiance & geniuenty of permits issued as we are in India & nobody to check from DUBAI. We have tried reaching out to AUH call center, Immigration, Airlines & Embassy but nobody is able to help us out. Please need your advice!!!! Request your help in undersatnding this, as one of agent has issued visa for my close relative & many other friends for employement in UAE. 1. We have recieved visa scan copy (Black & white) without embassy stamp on it only company stamp is visible also we are not able to track this permit no. online at eDNRD as it is issued by AUH(says agent whereas in visa copy it says issued : “Western Area”). Permit no. starts with 109/2015/02/0080xxx. Can you please help us know if this visa is geniune or fake? 2. Can you please confirm if Labour card can be requested online before entering UAE ? If yes that means VISA (work permit) is ok ? I have gone through online site of MOL which says person has to get Labour card within 60 days of arriving in UAE. Thank you so much in advance for your help in giving us advice as we are not able to find out if this Agent is trapping us in some fake visa or its geniune as he is taking good amount for issuing this. 1. Sorry I can’t help in that case. 2. Yes, labour approval can be taken before you enter UAE. Once labour approval is done, then only can the entry permit be issued. 2. Check labour contract through smartphone app. If you did not have labour ban from previous job, I don’t think it is a problem. Is their ban for woman on husband visa . If yes ,please advise how it can be uplifted . yes, there is labour ban on women with husband visa. It should not take more than a day. Actually it is a matter of 2 minute job once the PRO reaches the counter at immigration. So much of insight here. Great going. Iam working for a Marine company since past 6 years. We work for nearly 9 Hrs a day and we are not paid a single penny as over time charge. How do we get rid of this 9 hrs job?? Is it possible to claim for over time charges?? If so, can i claim for the 1 extra hour per day for the past 6 years? From all the past Labor inspections, company was instructed to maintain a time sheet, but nothing so far. just a manipulated time being written on top of the attendance register. All are scared to report the same to labor dept. I am not sure about your company policies. You can read about Overtime. If you are not comfortable, you should request HR to consider your request. I am not sure what is mentioned in your contract. Usually you do not need to provide any costs to the company. now i would like to know wich contract i should follow and if this restraint is valid as par law. The contract issued by MOL is a valid labour contract. I’ve been working in a company in Dubai for more than 6 yrs with unlimited contract, but last march 2015 i renewed my contract and i was surprised as they have change my contract into 2 yrs limited. if i will decide to resign from job now, do i have to pay 45days salary and not to get my graduaty..? is there any ban for me if i will not finish my 2 yrs limited contract. Yes, that is precisely true. sir, the labour card is different from working visa? if the labour card is already for printing? is there still a chance that the visa will be disapproved? You should already have the entry permit with you before the labour card approval. If you have employment visa entry permit, that means you have the visa approval. But visa stamping will on medical fitness. please let me know if there is a way to check a company’s status through only its license number? As opposed to the company’s code number? Is there a way to check that online? You can check the company details in DED site. The labour contract is not displaying after I input the all details. How I will get that ? working a company in AUH as a general accountant, on a limited contract and completed 6 months only. Not happy and I have got an offer in Dubai for a better package. Employer states I need to compensate for visa, medical n ticket expenses and 1.5 months salary .. not sure if this as per UAE law..
You employer is right. Under Limited Labour Contract, you will need to compensate your employer plus you also face the risk of getting banned for breaking limited contract. Good evening sir I am working with one catering company as a Catering Supervisor in Ras al khaimah free trade zone.since 7 months I am working with the same company.I am not happy with the company policy and late salary payment,Now I get one good offer from another catering company in Abudabhi.If I resign, company is asking 3500 AED for the Visa expenses.can you advice me legally this amount I have to pay for my present visa cancellation? No, you are not required to pay any such amount to the company. NOTE: I am not a legal advisor. How can I check my Visa cancellation status online? Your help would be highly appretiated. Hi Deepak bro… I hope that you will be fine. Brother i have applied for job in uae through an agent and now when i am checking my contract information on the website it shows “request already pending in the tas’heel enabled typing center”… What does it actually means?? Please help me out in this matter. May God bless you. Your application is under process or done. good day sir,i have applied for job in uae,my employer said to me that she will take to me the original passport for the requirements of labor application,so i give it to him after 1 week of waiting..my employer response”still wait for the processing” i am worried..how would i know or make sure they already process my papers? It does take time to process the application. Thanks a lot for your reply. How can I check my Visa status online? Your help would be highly appretiated. And do they have a right to claim money even if the have applied for visa? (I am surebthey havnt applied). Read: How to check visa status online? I was on a visit visa to dubai and got a job offer with a salary of 7000 AED as Interior Designer. The offer letter was accepted by me on 9th feb 2015. After that I didnt applybfor any other job. The offer letter had 3 mnths probation period mentioned. After that till date they havnt issued my visa nor any infoemation was given to me. I DID NOT SIGN ANY CONTRACT WITH THEM NOR I SIGNED ANY OTHER LEGAL PAPERS. i just gave the copies of my passport and educational qualification. They only said your visa is in process . After my visit visa expired i rwturned back to India on 14th April 2015. After waiting for 10 more days i asked them, they said its in process. I mailed them my unwillingness to join their co. On 25th april. After that they mailed me that I hav to pay 7000 AED as visa application and cancellation charges or else they will ban me. I am still in India as I didnt get any visa from them, nor any appointment letter , neither i signed any contract. Can they still ban me? Are they entitled to claim the 7000 AED. Sir I am in great confusion and stress. PLEASE HELP ME. If you have not signed any labour contract, they will not be able to ban you. However, check your visa status online whether it has been applied or not. You will have to contact MOL. Dear sir, i want to tell that i cancel my visa immediately but my company told me if you cancel the visa you should pay 1800. I complete 16 months. Now what can i do i will pay or not. I don’t think you should pay! actually i want to know about,i decide to resign from my current job,because of my company has many problems.i’m working as a Auto CAD Draftsman.salary 2850 dh.so if i resign ,i have a labor ban? I been Employed in oil firm in JAFZA from 2007, and in 2011 i transferred to Iraq with the contract says my gratuity will continue as per UAE laws, In 2014 My Monthly salary(A) & RiskAllowances(B) are changed to daily rate(AB) mentioning my daily rate as (AB) in Iraq. I am Given Food & Accommadation by Company How is the gratuity be calculated now Is it On AB or A.
gratuity will be calculated as per the latest drawn basic salary as per UAE labour law. hey, i just wanted to ask that if company fire me within probation so is there any ban, if persons salary is 3500. Finally how we can save from ban. You could stay up to 30 days in UAE after cancellation. Im writing this in regards to my resignation from current working company. I joined the firm in 2005 under Limited Contract visa and then on it is renewed time to time and it is valid till 22-6-2015. Im planning to cancel the visa and join a new firm.I would like to know whether the current working company can put any BAN on my visa. For such a long service, you may have no labour ban. Sir.. My labor card will be expired on may 1 and my labor contract is may 23., which one be follow on my last day of duty? Why the labor card and labor contract are not same date expiration? You should go as per your labour card. I am surprised why the dates are different. gud day sir Deepak! im hving a problem and so confuse about the rules. my company terminated me im in 5mos and half working ther as secretary. i filed case to mol not to figth just to know my rigths because i been also to tasheel labour to inquire before to file case. they told me i will have 3 mons. compensation because the company is the one who brakes the contract im under limited contract. but when the case was held on the ministry of labour they told me i dont have a compensation. why is like that same labour ofc was different laws?. what will i do? please help because im planing to go back to my country. im really scared. Were you under probation? If yes, there is no compensation! You do not have any reason to be scared. This is mentioned in the labour card. iam in my hometown waiting for my visa .. the message isnt gonna cause me any problem right ? It means that your labour card is approved. now you should wait for the employment entry permit visa. My friend was hired Jan this year & was given busy by his company but until now there is no starting date yet. It has been 3 mos that he doesnt have any salary or allowance which is why he’s having financial difficulties already. I jsut want to ask if that is legal? They havent given him his emirates card too even if he’s done with all the process. Shall he inform MOL about this? If you feel there is a violation, yes, you must file a complaint with MOL. I think so. Not too sure!! Yes, labour ban is automatic. Iam working has been 4 years 3 months, first contract is 3 years (dec 2010 until dec 2013, then my second contract is 2 years (dec 2013 until dec 2015). Now i have offer another job in UAE, so i will get automatic ban or no ?? please reply, thank uou very much. Considering your length of service, you will not get labour ban. Depends on your status at the immigration! I don’t think without cancelling your visa you can get visit visa! 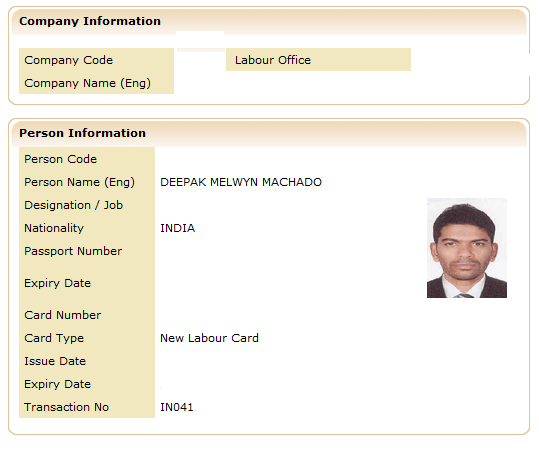 My earlier company did not cancel my labour card (Last working day was 31st july 2014. )and I was unaware about it.When my new employer tried to apply for my labour card it got rejected.I want to know how much expense approximately was incurred by my new employer. You could ask your employer. Dear my labour card has been expired on 27 feb 2015 as well my visa also expired 19 march ..
issue is that my company owner is creating issues to cancel my visa. as well i m not going to office also now a days. he is not picking my phone also and not coming to office. so any other procedure to cancelation.. There is no other option than to be cancelled by your company. “Request already pending for printing with the Tas’Heel enabled typing center” this is what MOL saying. I got job on visit visa and now at homeland. Is it showing that visa approved or what does this mean exactly. Your HELP is really Appreciating. you will have to go to a Tasheel centre to get the labour card details. i just got my emirates id but i don’t know what is person number and where to get it from please guide me. My wife is on bail as she has a cheque case. She has valid residence visa and Emirates Card. Now she has got a job, I will give NOC for work, will she require labor card now? Will she get one now? I am not sure!! There will be security clearance required. I AM WORKING IN SHIPPING COMPANY FROM LAST 4 MONTS .MY ALL DOCOMENTS COMPLETED BUT STILL MY LABOUR CARD PENDING . SO CAN YOU TEL ME HOW CAN I GET THIS LABOUR CARD ? You will need to ask your PRO. i joined company 2 month before but i am not satisfied with my job i want to resign but my employer ask me for visa cost is this legal or illegal what i can do please suggest me. It is illegal for companies to ask for such cost reimbursements. if company ask fo visa cost after resignation what i will do please suggest me and how many days they will take for visa cancellation. i am in probation period. You need not pay any visa costs. Yes, when you check your labour contract online, there will be salary mentioned in the contract. Actually sir I’m not in dubai , I’m on visit visa got job and come back to my home country, now more than 2 month has passed but every time my pro said you got visa. Now then I check labour site and got the message which I sent you earlier. Now sir guide me what I have to do because my company pro will nothing tell about visa status. There is no other way. You could ask your friends to visit Tasheel office. Sir i checked my status at mol web site without labour card and the messafe is that. Request already pending for printing with the Tas’Heel enabled typing center. Sir can you tell me what is this a d its means? You need to walk into Tasheel centre and show the receipt. They will give you labour card details. I am working in a beauty salon, my boss doesnt want to give me my contract to see how many hours we should work by day, we work 12 hours by day, sometimes more than 12 hours by day, six days by week but she doesnt give us extra salary. I have resident identity card, occupational health card, when i open webside to get copy of my contract, it ask me about my labour card No, and person code, where can i find all of thsese? Labour card number is on labour card. But since nowadays labour card is not provided and is merged with Emirates id (http://emiratesdiary.com/uae-tips/emirates-id-replace-labour-card-expatriates), you can obtain it from Tasheel centres. Not sure what document you are referring to! How can I check if my working visa is on process? Since the PRO of the company who hired me is almost 1 month making excuses why my visa is not yet released. He’s latest reason is that the system of immigration is down and I don’t believe in him anymore. Kindly advise. Ive been working on my company for one month, i havent sign the labor contract yet and havent get my medical done. I only signed my offer letter and given me a employement visa for 2 months. Will i get a ban if i wish to transfer to a new company which is not a freezone or government? Employment visa for 2 months? I am sure about this. Are you talking about Entry Permit? You may cancel Entry Permit, but if your company has started process of labor approval, you will have a ban. I am 9 months(unlimited contract) in my current company and I want to go for another company that is also wanting to take me in. The problem is their initial salary offer is only 3500. I told them about the 5000,7000,12000 rule to lift the ban. But their PRO doesn’t know much about this. Many said ban can be lifted if offer is 5000 and position is relevant to qualification, but I am a bachelor degree holder(certified public accountant). Can you please suggest what are our options? Should they increase the offer? The article has detailed information. my cousin is detained in immigration al awir. because she has a expired employment visa(entry visa) and she runs away from his sponsor. she have passport and employment visa(entry visa) with her. his sponsor is not processing her visa almost 6 months..no labour card no emirates id. nothing can you pls advice us what to do? I have nothing to say as she is already with authorities being detained. in case of termination you can ask for an NOC to avoid ban. Under limited contract you will face ban. I file complain to MOL last Jan. 11,2014 because until now i didn’t collect my previous salaries and gratuity from my previous company. They always promise only. I tried to understand their situation because doesn’t have collection until i feel unselfishness and no plan to paid me. Is there any validity from MOL about the pending salaries and gratuity? When you resigned from the company, did you sign any document that mentioned that you have received all your dues on time? If yes, the company is legally safe not to pay you anything. Can i ask some question im working as a sale assistant before on a supermarket but . After a months they transfer me to another supermarket then they told me work as a butcher even i dont know to use a machine . What the best solution sir in this case. I want to work to another company when imfinish my contract. Also they have overtime but not enough to sustained the pay for . Is there any violations that they need to paid ? You could resign from your position saying that your profile does not suit the job. However, you risk being banned for 6 months in MOL. I have a question. how about if i will resign from the company during the time of my probationary period. I am currently 1 month plus now in my company and i dont know if I am unlimited or limited contract since they did not give me a copy of contract as well. I cannot view as well my labour contract online since i dont know my labour card no and personal code. Will i be able to pay an amount if i will resign? You may resign. However, you risk being banned 6 months by MOL. I have been working for a company (Only to get the training) in UAE & I was there for just 2 weeks and I got the UAE labour card and I was relocated to Qatar. As soon I landed to Qatar I had my passport with UAE Visa cancelled and I surrender my UAE Labour card in order to get the Qatar’s Labour Card. Then I’ve been working in Qatar for one year and I resigned. Before two months back I came back to UAE on a visit & got a new job. But my problem is New company said they can’t apply for the new Labour card unless until my old Labour card is cancelled. Then I came to know My previous company didn’t cancel the labour card but Visa was Cancelled long time back. I wanted to know how long will it take to cancel the labour card & will it be a ban after cancelling the labour card. Please help me on this as my new company wants me to join them quickly. Labour card can be cancelled within a day. There may be labour ban on you. My Visa in UAE was cancelled long time back, since I was working in Qatar. Only the UAE labour card was not cancelled. Any idea about the ban? The labour card needs to be cancelled by company prior to cancelling visa. I am not sure how this is possible. Hello sir, I am working in abu Dhabi January 2015 end my work permit finish I don’t want to work what is the processor and company not give me my over time month of Feb 2014 he told he send to my home after I go so please give me advise please sir. Please please advice me sir.. I don’t think there will be any problem as you have not submitted any documents. My passport is with him since before sir. What will I sign he didn’t give me anything that need my sign. Thats why im asking if ever he dont want me to g home next month what action ir word I will say to him. Actually also my Emirates id will expired next month, because I have first sponsor befor this company. Im staying here in uae more than two years. Yes im leaving for good.. but I didn’t signed anything. Is there any problem sir?? Can I contact MOL or immigration if he dont want me to go..
better to sign and clear all the things. Is your passport with you? My work permit already finish on 5th dec 2014. But my visa valid upto 19th january. Now I want to leave this company. if i cancel the visa. Will i get any ban or not? give proper resignation and notice period. you will have no ban if you completed your contract. Im working at cleaning company here in abu dhabi for about 1 year and 3 months. Is there any problem if I want to go home to my country or do I need to pay there?? Please advice me sir.. If you have signed that you will pay, then YES. I have spent one year at my current company, Now I have an offer of about five thousand dhms. I want to switch in the new company. But I have now information about the immigration rules. Can I join the new company without any ban? Please guide me in this regard. I have joined in my duty on 1st May 2013 but my contract was officially signed on 2nd June 2013 with MOL, so when will my contract ends? as per my joining date or contract date? I have worked in a company and resigned the job within the limits of 6 months probation(including the notice period eventhough it wasnt required ) and went out of UAE with that time frame. My contract is unlimited and I hold Masters degree. When i checked in http://eservices.mol.gov.ae/enetwasal/employeeCredential.aspx – it says Employee Information Doest Not Exists. My previous employer told me that they will abscond me . Would you please advice me what would be my status ? And if they have absconded me , how will I find my present status in Dubai ? If your labour card is cancelled of course you will have no record. This does not mean your employer has imposed abscond. There is no way you will know this unless directly through MOL. Would MOL or my employer could give me a ban ? even if I’m unlimited contract,finished almost 1 year and i will give them my 1 month notice? You will have automatic ban in labour. My company is telling me that there is no labor card anymore and that it’s unified with the pataka already. Is this true? I also tried to check my contract online and it only showed me some kind of a receipt to be shown to Tasheel. What am I supposed to do? yes you can change, but may face labour ban depending on your contract. If you complete your contract, there won’t be a labour ban. Sir i have applied in a company. My all information is available on MOL just like labour card info and contract card request till one month. But i cant still received my visa. What is the reason?? You will have to ask your company PRO. I have applied in one of the company here in dubai after my cancellation from previous company. According to my new company that they have applied for a visa but when i checked in http://eservices.mol.gov.ae/enetwasal/employeeCredential.aspx but no application been done. and if they applied the visa and i will not use it to enter in uae do i get a 6 months banned? Your PRO is the best person to get this info. I recently got a job accepted a offer letter from the company and I am still under my husband’s sponsorship. however the contract says “limited”. the offer letter was signed on July and I still have not joined the company and my labour card is taken by the company. nw due to some personal and health issues I wont be able to join. so what I would like to know is that if I will get a ban. kindly advise me. usually they don’t ask. But it is better to keep all cancellation papers. I think if you are already here, there will be no ban. I have came across a scenario, that one company is providing Limited Contract without employees concern, which means the employee he or she hasn’t signed on the Contract. Is that really possible. 1. if the employee is in limited contract and with in the probationary period can he or she able to resign the job without any consequences. 2. if the employer demand the employee to pay the visa & other legal work related documents cost, what is the amount approximately, such as the visa, emirates id, medical, work permit and if any. Employees must consent with the contract. Why would the employee sign? 2. IF the employee signs such a contract, yes he/she will have to reimburse. Iam an Architect(BE engineer),i joined a company in oct 6th,iam on husband’s visa but my company applied for my labour card but they hav’t paid the fees yet(it is in the process,i hv got the paper in which expiry date in mentioned. 25.12.2014),i want to switch my job bcz of some reasons,my exixting salary is 9000 and new offer is 10,000.will i get the Ban? if your application is not processed, there will be no ban. I have a difficult situation here ..I joined a company 1 year before ..after 6 years I left that company and joined in another.So I got an automatic ban in the system.New company offered below 12000 AED.Situaltion was worse so I joined there.But the automatic ban was still there so new company increased my salary as 12000 in Labour contract to avoid Ban but the sponsor is not signing my papers now.So company told me that They will cancel the new visa and will provide a new .But DO I GET ANY BAN AGAIN with cancellation of new VISA? Or How to get rid of this situation? What you suggest? You will need to contact MOL. I have a difficult situation here ..I joined a company 1 year before ..after 6 years I left that company and joined in another.So I got an automatic ban in the system.New company offered below 12000 AED.Situaltion was worse so I joined there.But the automatic ban was still there so new company increased my salary as 12000 in Labour contract to avoid Ban but the sponsor is not signing my papers now.So company told me that They will cancel the new visa and will provide a new .But DO I GET ANY BAN AGAIN with cancellation of new VISA? Or How to get rid of this situation? What you suggest ? for visa cancellation, there is no ban. Only labour cancellation. Dear Mr.Deepak M, Good day ! My situation is sort of complicated !! I a General Practitioner, I have signed a contract with a private hospital in Abudhabi and they have applied for Work Permit from the MOL. For over 3 months they could not obtain me a visa so I told them and I have transferred my License to another Hospital also private and they have given me an approval letter signed to process my license transfer. The new hospital have applied to new work permit but they said i still have valid one under the old Hospital and i have to contact them in order to be cancelled. The old hospital was keen enough and applied for cancellation of the Work Permit Labour Card and sent me a copy of the receipt which I have sent it to the new Hospital ( Employer). My question is, am I going to face a ban? is the new visa application which is work visa gonna go smooth? in case you were wondering I have never worked with the Old Hospital neither I undergone any medical check or anything, I was only on visit visa an I returned back to my country waiting for the Work Visa which they could not obtain.My Medical License have already been transferred to the New Hospital and now is under their name. Dr.carl, for your profession there is no ban. For your profession there is no Labour ban. i am working under DMCC registered company past 10 years. due to some personnel issues i resigned my job as on 5th nov-2014. from 13th my management told me to not come office, we will consider your notice time salary and it will pay you.i am afraid they are planning to put me in a bad situation, i asked them to give me writing, but nothing happened. kindly advice me what i want to do in this situation..
You need to speak to your company officials. Get everything in writing. When is your last day of work? I have been in Dubai on tourist visa to look for a job, finally i sighn contract and i go back to my country to wait for work visa. after ten days i got from company a link with preapproval for work permin in Dubai after that company has told me visa will be after fw days, so when few days gone i didnt get my visa, company said need to wait for 1 week more for visa. i decided to open web site the labor ministry of dubai and check the status of my pre approval by number when i opened i found out that Bank guarantee need to be paid (Not Done) and Fees not paid (Not Done). After that i asked my company why they not pay they told me they had paid and not my papers in imigration service need to wait. i said ok will wait for one week more, situation has repeteated again. So can u give me any advice what is going on? And really am i right they not paid or not? These days immigration approval takes little time. You have to check with the company PRO. I am facing a series issue with my employer, i am working as a sales executive in a trading compony in dubai for more than 2 years 1 week before i called me in his office and told me that he already decided for restigate me because for last 2 &half months sales is less without giving a proper notice to me before. Because of my marriage on 5 December that i already informed him 3 month’s before i have to agreed on his decision. Your situation is company specific. I can not offer any suggestion in this. I a General Practitioner, I have signed a contract with a private hospital in Abudhabi and they have applied for Work Permit from the MOL. For over 3 months they could not obtain me a visa so I told them and I have transferred my License to another Hospital also private and they have given me an approval letter signed to process my license transfer. The new hospital have applied to new work permit but they said i still have valid one under the old Hospital and i have to contact them in order to be cancelled. The old hospital was keen enough and applied for cancellation of the Work Permit Labour Card and sent me a copy of the receipt which I have sent it to the new Hospital ( Employer). My question is, am I going to face a ban? is the new visa application which is work visa gonna go smooth? in case you were wondering I have never worked with the Old Hospital neither I undergone any medical check or anything, I was only on visit visa an I returned back to my country waiting for the Work Visa which they could not obtain. Thank you for your patience in advance going through my lenghy query. My Medical License have already been transferred to the New Hospital and now is under their name. i want to know that for bangladeshi nationality visa can transfer to other company ?. is there is ban to tranfer visa other comapny for bangladeshi nationality in uae or have some process.? I think the rule is only for new visas. So yes, there may be problem in obtaining new visa. There is nothing I can suggest except to request your passport. Employers can not keep passports. And also for free zone company’s?. And if my company give me a ban. Vill get freezone job right! I do not know about getting a free zone job. But you will not have labour ban if you join free zone. I’ve already finish my contract in my previous employer exactly 2 years. I resign exactly 2 years. The problem is they give me ban. Because they cancelled my visa and labor card 1 week before my last day. So now my new employer cannot process my visa and labor. What can i do sir? Yes. Request an NOC from your previous employer. i recently joined an IT company last month OCT 5th, i am getting new offers now,Can i change my job?. I didn’t get my visa stamped, & labour card. only medical is over. Is there any possibilities to change job without ban. Medical is over means you have labour approval. You will get a ban for 6 month. Am working on a agency company, from 6 months. I don’t like work and that company. And I got a job in freezon company. And jumeirah also. Jumeirah is a semi govt right. So that izz there I get any ban? Plzzz let me know. You will not have labour ban in Jumeirah Group. You will have labour ban. They can not put ban on visa. I am on a sponsor visa, n have joined as a Receptionist in a book shop they applied for a labor card, n now after wrking for 1 month I am not interested because of the pressure and odd timings, will they put a ban on my visa? Will I have Problem if I join in any other job? You will have a ban. Depends on your new salary. Should be more than 12K. Iam working for a medical centre my contract period is for 2 years. i just completed 4 month iam still in probation period. do i will get ban??? You will get a ban for 6 months. Thank you very much for your reply. After your reply i checked the contract in the mol website. in that contract nothing mentioned about visa expences. But the company itself gave me a contract paper to sign. In that they have mentioned if i leave the company before the contract period have to pay visa expences. Why the company taking signature in two different contract papers. Are they cheating me? plese reply. Yes, you are bound by company letter. MOL contract is a standard contract which encompasses labour law. However, companies can also have additional rules and policies. This is not cheating. You have signed the letter. How is this cheating? Presently i am working in a packaging material company LLC . My contract period is 2 years and i have completed 14 months. Now i want to cancel my visa and go home due to personnel matters. Now the company MD is asking to pay the visa and labour card expences (4600 Dhs) I have no money to pay. Please let me know the procedure. Also in my contract they mentioned after completing 12 months period i will get 30 days paid leave. That leave also still not approved. Please help me regarding this matter. Thank you. If it is mentioned in your contract that you will pay visa and other expenses, then you will have to pay that. Otherwise it is illegal to ask for such expenses. i was working in a restaurant in abu dhabi scene last two month and 20ago i have given them my resignation because of my personal reason and i have mansion it on my resing letter.and last sunday they cance my visa. and i got a good offer 2 days ago in that case i dont want leave uae because i got a offer and i ask my current company to give a copy of cancellation but they refuce and telling me to leave the country . what can i do? Yes, you will have to exit the country if you employer is asking. Can’t do that. PRO is the best person for this. I’ve been working on our company (not a free zone) for almost 3 months under 6 months probation period with 2 months contract. What if an offer of work came from government in Dubai, Is there a ban or what are the consequences for it? There will be no ban if you join government organisation. Hi, I would like to ask if how may I know if my employer is already processing my work permit. Is there any way that I could confirm? and how many days does the ministry of labour usually give the approval? Thanks! hi pls help me what will happen if i cancell my residency visa before the expiry date?do i get immigration ban?but i fimish my 2 years contract in labour. If you break limited contract, you may face 1 year ban in which case, yo will not be able to enter UAE and work. PRO will know about this. This depends on your contract whether you have to pay money to your company. new company applied for me employment visa as engineer but it got reject. i have completed 3 years and 7months from previous company. cancelled my visa properly and submitted all requirements. if i get a police clearance from abu dhabi the hr dept said they will try to apply again. and what does ” security ” mean. I have never committed a crime or violation in uae and had good relation w all in my previous comp. May be a similar name is under watchlist of various Government departments. Or yes, if similar name or you have any pending cases against you, this may show up. My current employer is a Construction company and I’m employed as a draftsman (as stated on visa) but working as an limited contract. My date of joining was march 13, 2012, I have already given my resignation.my contract period is 2 month. I want to know whether there would be a labour ban against me for six months if I leave the job. how many month i should work after resigin. If you have completed your contract, there will be no ban. I have resigned from my company a month after my visa renewal (same company), I was issued then my emirates ID but not my Labour Card so when I try to take a copy of my Labour Card Cancellation online I could not do not without the details from my L.C. could you please advice on how I can go through or get a copy. I am not sure how this is done as the systems are being integrated. Best thing is to approach MOL. Am working as a Designer in Abu Dhabi & am holding a dubai visa. I have resigned my present job,because i have got good offer with another company in dubai. current employer has processed my cancellation and i have signed a cancellation letter recently alsoi have intimated my last working to the employer. for processing new employment visa i need visa cancellation letter from the company,but they are not issuing. kindly suggest me where i can get my visa cancellation letter through online services.i have to submit that letter to the new company for visa process. There is nothing called visa cancellation form. Visa cancellation is stamped on your passport. If you are talking about labour cancellation, YES, you are supposed to produce it. However, with systems being online entirely, I am not sure why they insist on it. dear Deepak could u tell how i know about my labour contract agreement? if u know any site so pl tell me..
No restriction like that but there may be problem for designation if you do not have higher education. I had worked with M/S Dubai Dry Docks World through a contracting company as an Engineer from March to June 2008. My visa was of M/s Dubai Dry Docks World and employee. I have resigned from stable Marine and exited from UAE by 14-June-2008. When my present employer at Oman is trying a visit visa for UAE, the ministry is rejecting my visa stating that I had been reported as absconding (copy attached). Later when I contacted the contracting company, they informed me that their contract with Dry Docks had closed and they are helpless. Further I contacted M/S Dubai Dry Docks World and they informed that they are trying to solve this. But I have been hearing this for past couple of months and I am hopeless now. Sorry, I am not sure how to go about this. Better to get in touch directly with immigration through a lawyer. please tell me sir this two year starts with our labour card or stamed our visa ? Are you saying since 2013 July you are without visa? I visit that site mol.gov.ae and i found my contract too. But my question is I am working in uae since from past 9 months but I am really fed up with that job and I want to chance my job and I have one new opportunity, so can i chance my job now ? As I heard there will banned upto six months, but I am not sure in which case i will get ban and in which case not. Plz do favour me mate. how will I know if my working visa for Dubai, UAE was processed already? Your PRO will know about it. This article provides you types of bans you may receive. Hi sir, your site is really helpful but I can not view my contract since my company doesn’t issued our labour card. They said that it’s not important and the emirates id and labour card are now one..??? Because the day when we renewed our contract we tried to get the copy of it but they hesitate to give us. They only told us that we can print it by online..? But how can we know our labour card number? Thank you for answering. I hope you’ll reply as soon as possible. God bless. ive been working in the company for 3 mo nths, and i dont like the environment anymore. its stressing me out, i willl have a labour ban right if i quit.. but what if i will go back to my country will i still need to pay something at the airport? like labour ban? I am on visit visa in Dubai from Philippines and searching for a waitress job. ROZANA Restaurant in Al Nahda told they will give me job after three day training. And at that time they will hold my passport. I accepted. On the third day I told I like the job and ready to join. Then the Manager told I should pay 1500 then only they can give me visa. I told no. If then I don’t want to join and asked my passport back. But He is not giving back and told he have already applied for visa and asking for money to give back my passport. And telling if I don’t join he will put ban on me. How is it possible. I didn’t even accepted the job. Not even they have given me the offer letter or any thing like that. And I haven’t signed any paper. And I am on visit visa. How can he Ban me. i am a school teacher here in pakistan, due to some domestic issues, i am planning to come to uae, i just went trhough comments above, it is revealed that mini. wage is 1500 AED. But my agent is offering me a visa of al marai company (packing visa), he told me, 1000+200 (1200) AED. Suggest me whether it would be company visa or Contracter (thaikaydari system). and why are they not paying min. wage? I am not qualified to comment on this as your situation is not clear to me. And also you are outside UAE. Please make sure whether the company provides accommodation, transport, food etc. I would like to ask how can I check if my new employer already applied for my working permit..? The link is disabled by MOL. How is it possible. I didn’t even accepted the job. Not even they have given me the offer letter or any thing like that. You may complain to Dubai Police and MOL that the person has taken your passport. What is the reason for not accepting? i have completed 5 years 10 months in previous company. shall i know the current final settlement calculation. Because the rules are changing in U.A.E. Hi deepak good day im working in a company (not a freezone) i did resigned already because they hold my salary last sept until now they are not giving it to me, when i ask one of my collegues how the status of my resignation still it is not on process can i file any complain to my company for doing this im not going to work any more ffor 7days now and there is still no termination for me as far as i know in uae law 7days consecutive not going duty without prespective reason is ground for termination cause if they dont like my resignation then terminate me instead.. If you are not paid salary on time, you may file complaint with the MOL. However, do attend the office or they may take action. i am a civil engineer, i have spent 7 months in a LLC company having limited contract,my current visa status is of Civil Engineer, now i want to switch to another company ,as they are offering me salary of 7000 Dh, my current salary is 4000. also my employer is ready to issue me NOC, so either MOL ban for 6 moths will be applicable on me or not, as i have heard that there is no MOL ban for Engineers. If you have NOC, you will not have ban. If this is a temporary contract for 6 months and if they have applied for labour card, there may be an automatic ban. I request you to contact MOL as I am not sure about this. I have been worked in a company for about 5 days only, since the nature of work was more like malicious. They provided my employment visa expiring on Nov 2014. I work as a receptionist but my profession stated in my visa is MANICURIST. I have not signed any contract. No Internal contract. No labour contract. No labour card. I have been to medical and emirates ID processing. Is it possible to look for another job and be employed? If you have your labour contract under process, you may face ban. Or will i need to get NOC ? Please kindly answer my question…. under limited labour contract, you will face ban. NOC may solve the issue for you. My brother just 3 month before came to Abu Dhabi on 2500 DHS salary in one company (his visa is engineer visa). Now he is offered better package (6000DHS) on another company (Technician position). hi is holding graduate engineer certificate. does 6 month ban applicable for him. your brother will face automatic MOL ban for 6 months. If your company is terminating you, request for an NOC. When you have NOC, you may not get ban. hi, i have some questions..thank you. i worked in dubai but i wasn’t able to finished my contract, for some reasons. I filed a resignation letter and after i went back to the philippines. I am planning to go back in Dubai but as I go through the internet and checked about the banned. It was being written that your passport has a stamped of the word BANNED if ever so but when i checked my old passport it only had a stamped word CANCELLED. Is there any possibility that I can go back to Dubai as tourist? Thank you. Thank you so much for replying at my email.will the offices be opened on Monday? This Saturday, they are off I guess. First talk to the call centre. I don’t get your query. Visa is expired when it expires! Hi Mr deepak, good day! I have one question.. I am working and I signed a 2 years contract but I am under my husbands visa.. My question is, I want to apply in other work but i am only 4 month old in my current work. Will I get banned for not finishing my contract even if i am under husbands visa? Hi Mr. Deepak may I ask you a favor pls…where can I search from the MOI for the visa status, If it is already cancel or ban? I’ve tried to search from the google.com but i can’t find. Also I’ve checked from the MOI website I can’t find. Can you help me for this issue? Then 1 more question my friend she was working in Abudhabi then she went her home last January 06,2013 for emergency. then she didn’t go back due to her mother has a problem. Her visa would be expire this month of October 20, 2014. In this case what is your opinion? for visa status it is better to approach your PRO. Regarding your friend, did she mention to the company that she was not coming back? Has she formally resigned? Visa status can not be checked online currently. can you pls clear this one. My husband is working in a company and his visa will expire on 20/04/2015 as a two year contract and labour card expired on 18/09/2014.He got promotion 6 months before and his company changed his position in the visa and the contract also increased to one year more.So now in passport the expiry date is 20/04/2016 . But when we check the labour card in the website of MOL its showing Employee does not exist.Why its showing that way..
Congratulations for your husband on promotion. There may be an issue with MOL systems which are upgrading to serve everyone better. It should reflect soon. Please call MOL to clarify. I am working as engineer in well established company, i hav ecompleted 8 months in the comapany, my visa is als o engineer visa, my salary is 4k, if i switch a job ban will be imposed or not ? If imposed it can be lifted or not? good evening sir. i started as a bus girl last sept 28 2011, with an unlimited contract. under government also. i was promoted as waitress and now a captain waitress last june 2014. they didnt give me any new contract for the new position i only signed the increase as a captain and im going to finish my 3yrs and visa on october 19 2014. the sad part also is the visa im holding will not be renewed under gov. if i renew my contract i will be under labor contract. but im planning to leave the hotel on my finish contract/visa. 1. do i need to ask for the new contract as a captain for the sake of my graduity and certificate? 2. do i need to resign or just say i will not renew anymore? 3. do i need to work for 1 month notice after oct 19 2014/visa expiration? yes you need to inform the manager by giving notice as per your agreement. I was checking my status at MOL and it shows” Employee Information Doest Not Exists.” does this means the company didnt apply my visa yet? as i want to take the other company who offered me better than the current one. Please approach your company PRO for this. If the labour approval is obtained, you may have ban. I am working here in Sharjah Industrial Area 10, I arrived in UAE last July 23, 2014, my tourist visa expired last August 23, 2014 but I got this job here in Sharjah Industrial Area 10 last August 20, 2014. The company told me to extend my visa and so I did. Now I am working here and I have only 1 week remaining days. Still they are not processing my visa. What is the best thing to do? Working without labour contract or visa is illegal. And working on tourist visa is also illegal. Then what is the best thing to do now? They keep on promising me about my employment visa but until now its not yet process. Working without labour approval and/or employment visa may be illegal. I started my work with my company (DMCC Freezon) in May 2014 when my visa was stamped. After the second month, they discounted my salary with 1,000 AED saying that this is for your own good to push you. (Nothing was given to me in writing. Its just a verbal discussion and since July onward, 1000 AED has been discounted). (6500 AED in contract and receiving 5500 AED till date). 1. Since I am getting a salary offer as which is an appropriate raise plus better designation, plus the employer has not honored the contract (Bank Statement proof). Can i switch my job without a BAN (I think i still haven’t finished 6 months). Started 22nd April 2014???? Every employee is entitled to sick leave. My visa is until 20 October 2014, I want to take one month leave but I send 3 time request mail to our manager, but he didn’t reply once,I also don’t want to continue job so according to labour law if I stop my work , they can terminate me or not. one company in dubai gave me job letter during my visit visa in dubai.Then i exit from dubai to pakistan after end of visit visa.i have worked for Boss from 3 August by online(am web developer). But am not confirm may he apply for my job visa or not? how can i confirm from my passport number ? I am being offered a job in Dubai, what precautions i need to consider while entering into labour contract. And how i can check the company info. You need to check all the terms and conditions of MOL. You can check the company through their website. Visit bayt.com or linkedin.com to review the existing employees. hi mr.deepak,would you assist me to know that what is the minimum gap between two shifts for employee in uae ? if i finish my duty today at midnight should i returned to duty again at 0700hrs next morning as employer requset?.iam hotel worker .thank you. I am Working in jabel ali freezone as data entry operator due to loss of my husband job i want to sponser my child. he is 7 yrs old studying in Dubai and currently he is in india and my salary is AED. 3600 p.m.
so kindly guide or advice me to sponser my child under my visa and let me how to sponser my child because i heard that to sponser child we should drawn a salary AED. 4000/- which i am not getting. can i know any other alternative way to sponser my child without any problems. kindly advice me. You can request your company to relieve you and provide with an NOC. is it possible to get a copy of my labor contract through online? Because my boss didn’t give me any copy of my contract. also he didn’t give me my labor card just a photocopy of it. Right now the access to view your labour contract is blocked as MOL is in the process of integrating the Emirates ID and Labour Card. But this will be up soon. Ask your manager to provide a copy of the your labour contract. I am currently on limited contract for 2 years & 3 months and my labor card has been renewed 3 months ago while the visa has not been renewed yet by my employer this means I am already overstaying for 3 months, my employer kept on promising that they will renew visa however I’ve waited for log and put myself in trouble, aside from that my salary is always delayed. Now i found a new company and would like to know what is the best way to get out from my current company being on limited contract. Please help. If you have completed your limited contract, I think you may not have a ban. Hi I am Saba here.currently working in Dubai from past 25 may 2014. if i would like to change the job , Can i change and wil i get ban? and do i need NOC From Current company and do i need to pay to company any Amount? Yes you may get a ban. IF you would like to avoid it, read: http://emiratesdiary.com/jobs-in-uae-2/how-to-avoid-6-months-labour-ban-in-dubai-uae or NOC from your existing company is required. My salary is 2500 and contract signed 5000 becuz of my request for family status approved. but employer make the receipt of advance salary 15000 in advance and remain will be pay every month means 2500 my geniune salary with both sign in company letter head for safety. Questions is.. when I resig and switch the company, any claim employer can againt me? have been recruited on a monthly salary of lump sum AED 5000 against services I render for the company. And based on my request to our company and my personal problem and our company kind consideration, I have received half of my one year salary (AED 30,000) in cash as an advance payment to resolve my current personal problems. And hence, I am committed to receive the remaining of my salary (Aed 30,000) on a monthly bases of AED 2,500 and there will be no claim and any issue from my side any time in the future. Mr. Depak please Advice I sign this contract in company letter. Seems Ok to me. For legal matters it is better to approach a lawyer. This should be on a plain paper as this is your undertaking and not company’s undertaking. I signed it on company letter head already. I sign it on my will No problem for sign. But, Employer can claim for recover? if I resign or change the job before one year? Its have value in labor dpt in your eye? If you resign, you will need to repay the amount. Yes, it holds value as you have signed and acknowledged it. i am working for a trading company from 21st october 2012 and its going to finish labour car on 21st october 2014. I have 30days credit in my a/c. I get another job and they are telling to join immediately. If i resigned i will ban for 6 months. Plz let me know. The link has been taken down as there is integration going on between Emirates ID and Labour Card. How can i check my personal no in my labor card? If it is a labour ban and omcase you get a better position with better salary you can stary work . Good day Sir, I am working in my company for 7 years, I am on unlimited contract. I filed my resignation with 30 days notice and now after 30 days my employer did not sign my resignation and asking me that I should have somebody to replace my job before he will let me go and will sign all my papers providing that I should teach also my replacement about my work. Is it right that he always denying my request and also he cut my visa expenses on my gratuity? I have lost my job in Dubai and now I am in India. I am not able to pay me credit card payments in Dubai. What action can I face for non payment of debt. can you suggest how to check a name of a ban candidate in UAE, if ban type immigration. sir i would lie to ask if how should i know my expiry date of my labor card online… i have my passport but my labor card is in my company… and what should be follows in 2 years end contract, is it the labor card, date of joining or the residence visa…. thnx for the reply sir…. I work in Jafza and my labour card has only the ID number and no Person code shown in there. i am Dr. sunil kumar. i am facing one problem. i received a job agreement from al baraha hospital,and that HR department asked me to contact one agencies name oval tours&travels for my work visa/permit and i have to pay for my visa and they will return the money once i join the job. My salary is 3000/- with accommodation dubai visa, can i apply my family visa..
i worked in a private company for 2 yrs and 9 months. its a limited contract which 2 yrs. i renewed it last october. i resigned already but i told them ill be goin home to my country. so they gave my documents and gratuity back. I got a job offer now but my previous employer told me that if they found out that ill be working with another hospital, theyll put a labour ban and immigration ban on me. is it possible?? can they do that?? i am under my father’s visa btw. Just to know about my daughters visa , I have cancelled her visa on 01-06-14 and had a grace period till 30-06-14 to change status within country. Since i changed my new job and Visa stamping is done on 10-07-14. As it is already exceeded grace time and its almost 20 days after grace period, can you guide me if my daughter has to exit the country with paying fine or can i sponsor her in taking a new visa now within this country. For info, my daughter is 14 months old and she is currently in Dubai. Please revert ASAP for proceedings. Hi Deepak, good day, i want to resend my message, because you not answer my question about this. i am working in dubai from may 2014 onwards. but my company is giving salary not on time. like next month 25 they are giving last month salary. sir is there any rule for issuing salary date. Hi sir, i want to ask if ever i cancel my working visa, there is possible that i get ban? Because the license of my company is block already, and change it to another license, but my visa is under the license of old license that block already, please answee me, thankyou..
i am aazeer.workin company goint 11/2013,my contrect start 4/2014,my visa chang date 2/2014.my agriment salary 5000/-,this company this salary not gave.start to to day 1000/- dh only pay.befor tel six month after all salary gave.but up to date not gave .i give u 1letter manager no answer.2nd letter Send email ovner.no replay.pls help me.what i do. i am working in an industry (tissues idust.) in shj ind 3. my join date is 26th Jan 2014 as per labour card (valid upto 26/01/2016), now i want to cancel my visa, i informed to the employer then they asked me visa exp, they told my visa exp is 4700 aed, is it right visa exp for an industry in sharjah, whats should i do? I have one question to ask you Currently i am working in Dubai. i join in my company 13 march 2014.
but i want to go home(india) because their is some problems at my home, their situation have to pay a amount to company for cancellation of my Visa. Sir i just want to ask what will i get or what will my company will give me for my annual vacation leave . I just want to know so that i could ask them to arrange prior to my leave vacation leave. My contract is unlimited i start working June 12, 2013.
good day sir, how can I check if my employer is applying my working visa? I am currently working now with tourist visa.. may visa expires on june 22, 2014. it was my first month here in Dubai,, i was just worried about the penalty for over staying, my employer holds my passport. we have two licence in our company, and my visa is under at first license we have before, and change it to another license, and now we have to two license, they are both expired last April, and my contract is finish on December, i work for 1 year and 6 months, i want to cancel my visa, because no day off and almost 14 hours of work, no over time pay, still my visa is working? there is a chance that i get ban if i cancel? please tell me, thank you. since your company has not renewed the licence i dont think you will get ban in this situation. I am in my husband’s sponsorship. I work for a company in Dubai with their labour card. My husband is changing his job from a company in Dubai to one is Sharjah. Will my labour card be cancelled when the visa is changed. Should I apply for a new one after the new visa is issued? Is there any other option? Deepak..the typing centres ask us to cancel labour card before cancelling visa. Where should I enquire regarding this? Thanks for your help. My husband is a taxi driver, working with Dubai Taxi for almost 3 months now. On his contract there is no basic salary only an allowance of 1000. He have an offer with a travel company and would like to resign, my concern is when he went to RTA office the HR told him that he will have a one year ban. As per I know, if the person doe not have a basic salary, you do not have a ban if you resign from the company and is it possible for the travel company to lift his ban in case they are going to impose it on my husband? Thanks for the help, your site has been a very reliable and dependable site for everyone who seeks for an advice. Hi Sir. Would just like to ask help from you. I was hired last May 5, 2014 and my first 30days has already expired May 12, 2014. Then my employer said I can just extend for another 30days while they are proceesing my employment visa. I am now on my 60th day. May visa will expire tommorow, June 12, 2014. I asked my boss if he already applied for my visa. And he said he is just wiating for the pink card from Labour. May I ask where can I check online if he really applied for my visa and if it has been granted by labour already. I am worried now about my employment. Hoping to hear from you. we have to type in, when i begin to type nationality (INDIAN) after year of birth i cant see the letters coming? My wife under my sponsorship working and willing to join in another company. Whether the employer is responsible for to cancel her Labour card issued or what if they have not cancelled and if she joins in the new company? hi sir,hope you are doing ok. I recently got hiered by s company and i was told you could immedieatly check if you visa is in the sytem i checked and they told me that my information does not exist.Now the employment visa is out i checked again and they told me the same thing that my information does not exist in the system.what should i do sir because i am so worried! Now I am working in a Restaurant group as an Accountant , getting Dhs.2500.00 as salary, I started my work on November 2013, now I wish to resign after i finish my 1 year 6 months work with them due to the work environment and work overload. If the Employer grand me the NOC, can I change my job to other company without getting 6 months ban?? Kindly give me the necessary advice about this. dear sir may home have imergency.but may company not give me ticket. also sellry hold what can i do . I would like to ask if employer can request employment ban / immigration ban (1yr ban = 6months labor ban + 6months immigration ban/employment ban) while cancelling employee’s visa with employee not aware about it? 2nd: Is there a formalities that the employee would be called up by the authorities informing that she has 1 yr ban or employee has to check it with authourities only? 3rd: is it possible that employer can request immigration ban/employment ban after the employee exit from uae? 4th: if 1yr ban is impose to employee, can the person enter uae again as visit visa? Or she has to wait to finish 1 yr ban before she can enter? I want to ask if i dont have labour contract does the other company can give me a visa? ITS GOING TO BE ONE YEAR AM WORKING IN MY COMPANY AND I AHVE SUBMITTED MY DOCUMENTS IN COMPANY ,I WAS SUPPOSED TO WRITE ONE BALADHIYA EXAM HERE IN ABUDHABHI AND I GAVE MY CERTIFICATES TO COMPANY PRO HE IS OF UAE NATIONALITY ,NOW MY EXPERIENCE CERTIFICATES ARE MISSING FROM COMPANY ,I ASKED MY MNANGER HE TOLD HE DOESNT KNOW DEN I ASKD MY PRO HE ALSOS AYING THE SAME.MANAGER IS EGYPTIAN AND PRO IS OF EMIRATES NANTIONALITY .WHAT SHOULD I DO TO GET MY CERTIFICATES BACK AND COMPANY ALSO TOLD ME TO SEARCH FRO ANOTHER JOB AS I HAVENT COMPLETED 2 YEARS OF CONTRACT HERE.I DIDNT RECEIVE ANY OFFICIAL LETTER FROM MY MANAGER REGARDING CHANGE OF JOB HE JUST TOLD ME ORALLY.SO WHAT SHOULD I DO CAN YOU PLEASE SUGGEST. I was checking my labor card status but it is showing “Invalid employee’s detail”. Why it is not showing me status online. I will be able to finish 1 year by end of May 2014 but just to be on the “easier” side, is it possible to just declare myself as a high school diploma holder instead of a bachelor degree holder? I do have my high school records and it will be less burden to my future employer as they are only required to give a salary of at least aed5k…Being a bachelor degree holder might be a little challenging in situations where your new employer can only give you a salary which is below 12k. Hi, I am working with recent company for last 1 yr for unlimited contract(2 yrs ). could labour ban imposed on me before completion of my contract. my previous company employment was 6 yrs. kindly advice. My company is not providing me any airfare ticket back to my home country i am an expat working as a school nurse here in Dubai. Providing airticket is part of uae laws right for expat?Please help me so that i can ask my employer to provide us ticket. He is telling us that since we are paid during vacation thats why he is not ggiving us an airticket. It isn’t fair. Even every 2 yrs he cant provide us? Depend on the agreement what you have agreed and signed for. i have applied two company before. both i have given the requirements for the e- visa. but i spoke to the first company that i will not continue working with them and they did not inform me that hey applied me working permit in mol. when the second company is about to provide me e-visa they told hat i have active working permit in mol. need to cancel it first so i spoke to the first company to cancel it. its about 2 mos ago already they always saying that tom tom tom.until now its not cancelled. they said that they renew their trade liscense and need to wait it first.what will i do now sir? You will just have to wait till they cancel your work permit. Explain your situation and try to convince them. I will be able to finish 1 year by end of May 2014 but just to be on the safe side, is it possible to just declare myself as a high school diploma holder instead of a bachelor degree holder? I do have my high school records and it will be less burden to my future employer as they are only required to give a salary of at least aed5k…Being a bachelor degree holder might be a little challenging in situations where your new employer can only give you a salary which is below 12k.